Congratulations Brittany! Please please me at foodjunkiechronicles@gmail.com for details on how to redeem your $75 store credit at Stubbe Chocolates! I guarantee that you will enjoy all the wonderful truffles, bonbons, chocolate bars and more at Stubbe! I also want to say a big THANKS to all the contestants who participated in this giveaway. 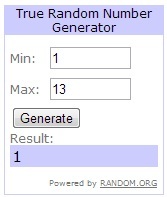 I went to "True Random Number Generator" from random.org to randomly pick a winner from the above list.